Demonstrating the importance of acceptance and understanding, Oelschlager’s A Tale of Two Daddies inspires us to look beyond ourselves and societal norms in order to see how beautiful family is even if it’s different from our own. Through the curiosity of one child trying to comprehend the family dynamic of another, Oelschlager’s children’s book goes through the day-to-day activities that the young girl and her two fathers experience together. Aesthetically pleasing with an extremely adorable story, A Tale of Two Daddies brilliantly conveys that no two families are alike yet that doesn’t make it wrong. Can Oelschlager spread this beautiful message to the world simply through the written word and gorgeous illustrations? To which she answers: “Daddy is my soccer coach. / Poppa cooks me eggs and toast.” It becomes clear that the family bond is unburdened by any cultural discomforts. The other day, I finally decided to sign up for a NetGalley account. I know, I really should’ve been on this sooner. After being warned not to go crazy with books…I went a little crazy. There’s just so much! Any who, I saw that Oelschlager’s A Tale of Two Daddies and A Tale of Two Mommies were both available for download and I had to download them! Ever since reading And Tango Makes Three, I’ve being eagerly seeking to open my LGBTQ+ repertoire, especially in the realm of children’s literature. Oelschlager’s children’s picture book is a delightful read, expanding greatly on such an important topic in a relatively small piece of literature. Through the eyes of a child, Oelschlager demonstrates how a family with two dads or two moms is the exact same as that with one mom and one dad; the love and adoration shown in this beautifully illustrated picture books brings home the idea that love is love, which a mundane thing such as “gender” can’t restrict. The love I have for children’s literature grew immensely after reading this story! A Tale of Two Daddies follows two young children who are playing in the park, having a conversation about how the young girl protagonist has two daddies rather than one mom and one dad. In the book, the boy asks her questions about which parent does which task or duty, such as doing her braids and tucking her in at night. By the end of the story, the boy sees how her family is no different from his own, for both come from homes where their parents love them unconditionally. The question and answer part of the story was not only really adorable, but very insightful. This dialogue shows how certain tasks and chores performed by parents are still stereotyped by gender roles in our society. Sad, but true. The wonderful thing though is Oelschlager’s ability to show that dads can braid hair as well as coach a soccer league; we don’t need to have one male and one female parent to do one or the other, and it most certainly doesn’t mean one gender is unable to perform tasks that are seen as too “feminine” or too “masculine”. I applaud you Oelschlager, for we so desperately need literature that shows hobbies and interests and talents aren’t defined by our gender but by what we enjoy doing! 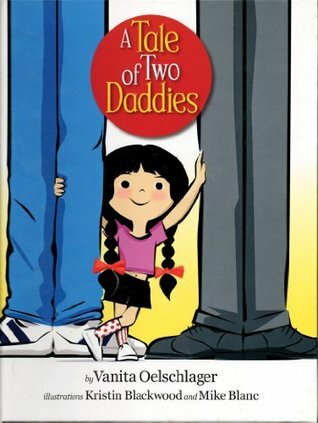 The characters in A Tale of Two Daddies are limited to the boy and girl playing on the playground, in addition to the little girl’s “Daddy” and “Poppa”. None of the characters are given names, but that doesn’t make them any less likeable. Through the girl’s description of her Daddy and Poppa, you can’t help but love these unnamed and unrevealed parents. Her description of how they care for her shows the wealth of love and nurture they provide – it’s so cute! I also enjoyed how the boy isn’t accusatory towards the girl for having two dads; he’s simply curious about something he hasn’t been accustomed to seeing or hearing yet. This alone is a message that we should be more open to showing our own children or future children that families may not look like our own and how love isn’t so easily defined. The only real character development is possibly the boy for he learns about a household with two dads is okay. However, I feel there’s personal development after you read this. You yourself grow, having a new perspective on family dynamics. It’s definitely an eye-opener book. Blackwood and Blanc’s illustrations are exceptionally delightful to look at while reading this story. Tremendously cute and aesthetically vibrant, the illustrations are very cartoon-like which I find are quite appealing to both children and adults. The drawings are definitely the focal point of the pages in the book, but it still doesn’t take away from the sentences. If anything, the pictures help reaffirm the emphasis that children can be loved and raised well even if they have parents of the same gender. Not only do you read the love through the story, you see the nurture and care the young girl receives through the drawings. I simply loved going through and seeing the illustrations! How can you not love their work?! The language is extremely simple, with no more than a sentence on each page. The dialogue matches that of a child, which I greatly appreciated for it reflects the characters more authentically. Rather than go into the complexity of the issue regarding LGBTQ+ rights, Oelschlager maintains this childlike aspect; simply put, how the young girl responds is simple and to the point since she’s at that point in her life where she hasn’t been taught that there’s something wrong with her family dynamic. It’s a superb teaching tool for children, for it’s easy to follow and it shows from an early age that having two moms or two dads is nothing to ridicule or be ashamed of. Oelschlager’s A Tale of Two Daddies is a heartwarming picture book that wonderfully tells a story about acceptance and open-mindedness. Told through the supreme wisdom typically only found in that of a child, Oelschlager’s story shows what it truly means to love both your family and yourself. Is A Tale of Two Daddies on your TBR list? One of my good friends is having a baby in October and I wanted to get LGBT inclusive children’s books for her and her husband. They were so excited! I almost got this one, but went with “Donovan’s Big Day” instead (as well as “Tango Makes Three”). I’ll have to read “Donovan’s Big Day”! I loved “And Tango Makes Three ” in addition to this one. They are such beautiful pieces of literature and really make it easy to understand how families are not all the same. That’s wonderful of you to buy them the books!! !